Until recently the common brown Panther Mushroom of the Pacific region of North America was thought to be the same as Amanita pantherina (DC.) Krombh. of Europe. Sequence data now makes it clear that we have a distinct, apparently endemic version of a notorious toxic mushroom. 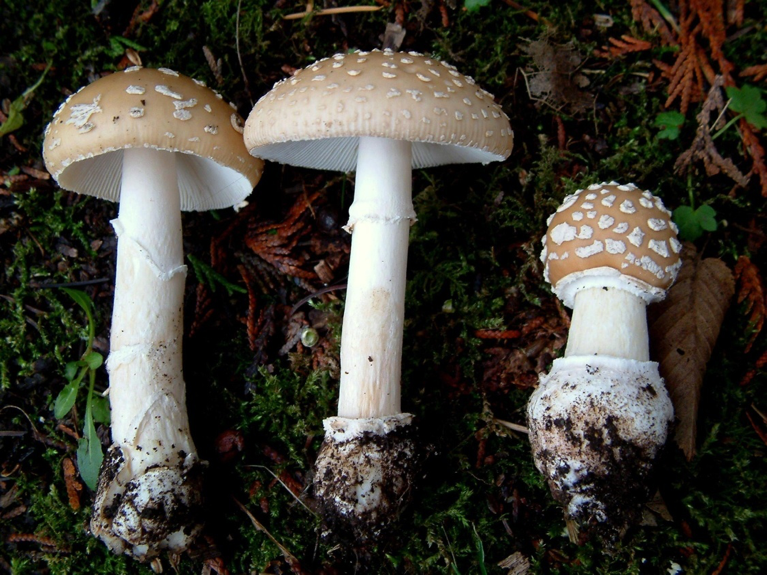 Amanita pantherinoides was first described from near Seattle Washington in 1912. Poisonous, contains neurotoxins causing inebriation and delirium. Toxins: Isoxazole compounds called Ibotenic acid, muscimol, and muscazone. Small amounts of muscarine may also be present. Drowsiness, confusion, dizziness, uncoordinated movements, delirium, illusions, muscle twitching, deep sleep. In some cases convulsions or seizures may also occur, especially in young children and dogs. Grows from the ground near conifers and broadleaf trees. Common in spring, summer and fall when ever temperature and moisture conditions are suitable. These are rather small to medium sized Amanitas with a rather slender form. The stem is usually longer than the cap is wide. This mushroom is usually found with conifer trees in natural areas but has adapted well to human-created urban settings where it happily thrives with a variety of non-native broadleaved trees and conifers. They make white spore prints. Caps 3 to 10 cm wide, at beginning spherical soon opening to convex and eventually flattening out in age, viscid when wet and young, a pale or light yellowish brown to yellow-orangish brown with usually more brown over the darker center. Cap margin is smooth when young but as the cap expands the edge develops striations or faint grooves which become more pronounced with age. Cap covered with smallish scattered warts or scales of white to cream colored rather cottony veil remnants which tend to be rather evenly sized and spaced, these may rub or wash off easily. The flesh of the cap is white and not staining when cut or bruised. Gills are white and crowded and free from the stem. Partial gills are truncate. Stems are 5 to 13 cm long and 0.5 to just over a cm wide, white, somewhat tapered upward and with an expanded base or bulb. There is a white ring or annulus in the upper portion of the stem which may be easily detached or destroyed by handling, the upperside of the annulus is smooth without grooves from the gills. The volva is white and remains as a cottony white thin edged collar or rim around the shoulder of the bulb. There may be a few scattered faint bands of cottony veil adhering to the stem surface above this. The flesh of the stem is whitish and the center of the stem is narrowly hollow and partially stuffed with loose white cottony tissue. Microscopic: Spores are 8.7-11.0 x 6.3-7.9 microns, elliptic to elongate, smooth, thin-walled and hyaline, non-amyloid (not blue in Melzers iodine solution). The Panther Mushroom has always been the most frequent cause of mushroom poisoning in BC and the Pacific Northwest. Because of its inebriating properties it has the distinction of being among the few poisonous mushrooms sought out and eaten intentionally for their toxic effects. In June of 1976 near Victoria a Labrador female dog and her litter of nine 4 ½ week-old puppies were put in an enclosure in a treed yard where mushrooms later identified as Amanita pantherina grew abundantly. In an hour one puppy had died and others were showing signs of intoxication and were described as being only able to use their hind legs, pushing their noses on the ground and dragging their front legs. Within two hours after exposure another puppy had died, and all were taken to a veterinary clinic where a third died three hours after exposure. All dead puppies had pieces of mushroom in their stomach upon necropsy. Atropine was administered to the remaining puppies, they had convulsions for 12 hours but after 17 hours had recovered. In June of 1986 in Castlegar a married couple both in their sixties ate a lunch made with wild mushrooms picked on their property that day. After about an hour the woman, who ate more, and then the husband both experienced nausea, dizziness, hallucinations, vomiting and muscle paralysis. A couple hours later both lost consciousness. Both were hospitalized and were released the following day apparently completely recovered. Samples collected from the site were identified as Marasmius oreades and Amanita pantherina. In May of 1994 an 18 month-old toddler in Victoria collapsed after eating mushrooms in the yard. He lost consciousness and was taken to hospital where he slipped into a coma. The child recovered. In May of 1994 an 18 year-old male in Courtenay on Vancouver Island was found dead from asphyxiating on his vomit after eating Panther Mushrooms to get high with two other young people. A large amount of alcohol was also involved, and alcohol poisoning was ruled the primary contributing factor. In April of 1996 a puppy died and mushrooms were found in the stomach on necropsy. Mushrooms growing in the yard were identified as Amanita pantherina. The dog had experienced tremors, tonic-clonic seizures and ataxia and died 1-3 hours post-ingestion. In May of 1996 a six year-old female child nibbled portions of a mushroom fitting the description of Amanita pantherina, “brownish coloured cap with raised white dots and a ring on the stem”. Four hours later the child was reported as drowsy but able to sit up and having slightly dilated pupils. She was referred to hospital, administered activated charcoal and kept under observation and soon recovered. In May of 1996 a four year-old male child was poisoned in Langley after eating mushrooms growing near home. About 15 minutes after ingestion he became dizzy, “spaced out” and fell asleep. He was taken to hospital and found to be unresponsive but breathing on his own. He was unarousable until he awoke the following morning, and was described as being “fidgety”. Samples of mushroom from the yard were identified as Amanita pantherina. In May of 1996 a two year-old male child was poisoned in Courtenay after apparently consuming mushrooms from yard. About a half hour after playing in the yard the child was found flaccid and unresponsive, was paralyzed and ventilated to control seizures. He regained consciousness the next morning and gradually recovered normal speech and coordination. Amanita pantherina were identified growing in the yard. In May of 1996 a 15 year-old female in Victoria ate Panther Mushrooms to get high and experienced vomiting and became drowsy. Her friends had told her “you can get high and you wouldn’t die”. In May of 1996 two young adults in Nanaimo, a 15 year-old female and a 20 year-old male, ate Panther Mushrooms to get high. Both were hospitalised after becoming comatose and exhibited twitching. Both recovered. In May of 1996 two young adult males in Nanaimo, a 19 year-old and a 21 year-old, ate Panther Mushrooms to get high. Both were hospitalised after one became comatose and exhibited twitching, the other experienced mild delirium and twitching. Both recovered. In May of 1996 a77 year-old male in Nanaimo was poisoned after a large quantity of Panther Mushroom was eaten as food, mistaken for an edible mushroom. Soon after eating he became dizzy and within an hour comatose. He was intubated while on route by ambulance to hospital. He had seizures and was placed on a ventilator in ICU. He recovered by late afternoon of the following day. In May of 1996 a 63 year-old male in Hope ate what he thought were edible mushrooms. About an hour later he felt light-headed, was tingling all over and had a slightly dry mouth. His symptoms appeared to be subsiding when he visited his physician four hours later, but as he later began to have mild hallucinations he was hospitalized overnight for observation. In May of 1996 a 57 year-old female on Gabriola Island ate a mushroom that grew in her garden “because it was there”. 1 1/2 hours after the meal she had nausea and vomiting, then felt weak and “passed out”, sleeping fitfully with bizarre dreams for several hours. No seizures were observed by a friend who was present. By the following day she was still nauseated, slightly light-headed and weak. The mushroom was described as having a pale brown-yellow cap about 2 ½ inches diameter with raised patches and a hollow stem. In May of 1996 two puppies were poisoned by mushrooms and exhibited decreased level of consciousness, increased tone in the tails and jaws, muscle rigidity and tetanic spasms in the back. One puppy died and upon necropsy the stomach was found to be filled with mushroom fragments. The second dog recovered after gastric lavage which recovered large amounts of mushroom fragments from the stomach. In May of 2000 a married elderly couple in Nanaimo prepared and cooked wild mushrooms with garlic, they had apparently been collecting and eating wild mushrooms for 40 to 50 years in the area. The man insisted they were good mushrooms, chanterelles, but the woman thought they looked different. The woman ate only a teaspoon because she didn’t like the taste and her husband ate the rest. The man experienced severe symptoms and was rendered unconscious and ended up in Intensive Care. The woman had milder symptoms but was also hospitalised. Both recovered and were discharged after about a week but were reported to still feel weak and have difficulty walking. Mushrooms were identified as Amanita pantherina. 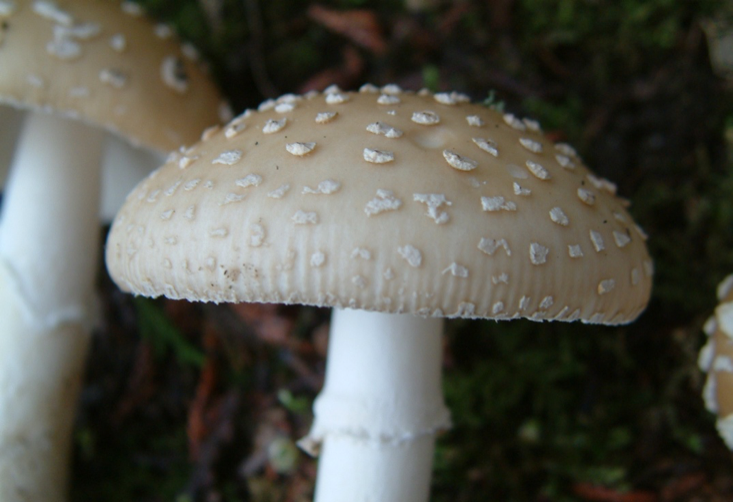 In May of 2002 an adult male was poisoned after eating mushrooms in Nanaimo, later identified as Amanita pantherina. The patient recovered. In April of 2016 an adult male was treated after consuming Panther Mushrooms on a Gulf Island. Thirty minutes after eating he was stumbling, confused and behaving inappropriately. Hospitalised overnight, vomited 3 times, combative at times, incontinent of urine, during 8 hours observation liver enzymes remained normal and he recovered by morning. The mushrooms were mistaken for an edible species. 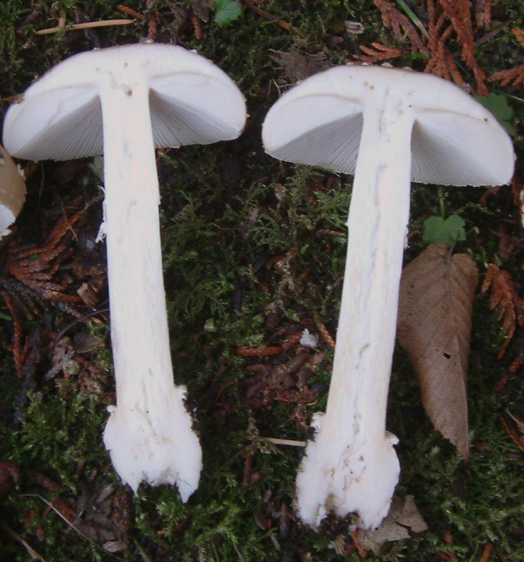 In October of 2016 an adult female in the Kootenay area consumed one Panther Mushroom cap, described as big white flat with gills. Four hours later she awoke from bizarre dreams, “felt like looking through kaleidoscope” and had vomiting. Symptoms subsided by morning, labs OK. Only the basal bulb and crushed stem fragments remained for analysis. The mushroom apparently was thought to be an edible species. Benedict, Robert G. 1972 Mushroom Toxins Other than Amanita. Chapter 11 of Microbial toxins, edited by Kadis, SA, Ciegler, A and S Ajil, Vol. 8 (Fungal Toxins) Chapter 11, Acad. Press, New York. Benjamin, Denis R. 1992 Mushroom Poisoning in Infants and Children: The Amanita pantherina /muscaria group. Clinical Toxicology 30(1):13-22. Waser, P.G. 1967 The pharmacology of Amanita muscaria. In D.H. Efron, B. Holmstedt and N.S. Kline, editors Ethnopharmacologic search for psychoactive drugs, U.S. Government Printing Office, Washington, D.C. pp. 419-439. Published In 1979.